A short life story on my friend and artist Deon Lubbe. He was born in 1957 in South Africa and graduated high school in 1975, the year I was born. He then did his military service which every South African had to do, two years as service to his country. After this he started in long distance transport driving to earn a living and then started his career with Nature conservation in 1978. This is what makes him so interesting, especially to me and anyone that is a wildlife enthusiast. Dealing with problem animal control where ranchers had problems with leopard, cheetah, spotted hyena, etc. The stories are always great and had quite a few of these experiences with him. In 1981 he married his lovely wife Corlia and they had two sons, Scheepers born 1989 and Christof 1990. Following his career as problem control officer he started ranching with cattle and progressed into game ranching in the 90’s and this is exactly where my first lease as outfitter & owner of TG Safaris was when I started hunting “Drie Koppies” in 1998. Eventually we moved on and bought our first property as everyone knows it today at Sand River Hills. Deon followed the same direction as me after land claims on his land and surrounding properties. He bought a small property called Kameeldoornspruit down the road from us. Always an adventurer he started flying as one of his hobbies which would have a tremendous impact on his livelihood come present time. In 2012 I received an alarming phone call out of Botswana that Deon and my nephew Arno were in a bush plane crash. Scared out of my wits we arranged for a chopper to evacuate them from the Botswana border where the chopper could meet them at the border after a terrible road evacuation. In the end after months Deon made a full recovery with the exception of his right elbow where the bones were totally disintegrated. Up until this time Deon only painted as a hobby over his lifespan and most of his paintings were gifts and hardly did he ever take money for them. I have two myself from this period of his life. We always tried to get him to paint more commercially and I think over the years managed to get around five out of him to sell to past clients who all cherish them. Today Deon is farming his piece of property and after three years of failed surgeries he is painting once again, without solid bone in his elbow. Note the photos of him painting. He supports his right arm with the left when he does paint, but fulfilling this passion and being able to now support his livelihood income doing this he finally agreed to do a few select paintings each year. I always wanted him up on our website and I finally managed to do get his approval this time round. Please feel free to support his talent. These are truly exceptional art works and personalised work from a unique artist I have a strong bond with. We take no commission on his work and 100% of the funds will go directly to him. We would love our clients to buy some of his wildlife artwork or order their personalized paintings from their trips with us. 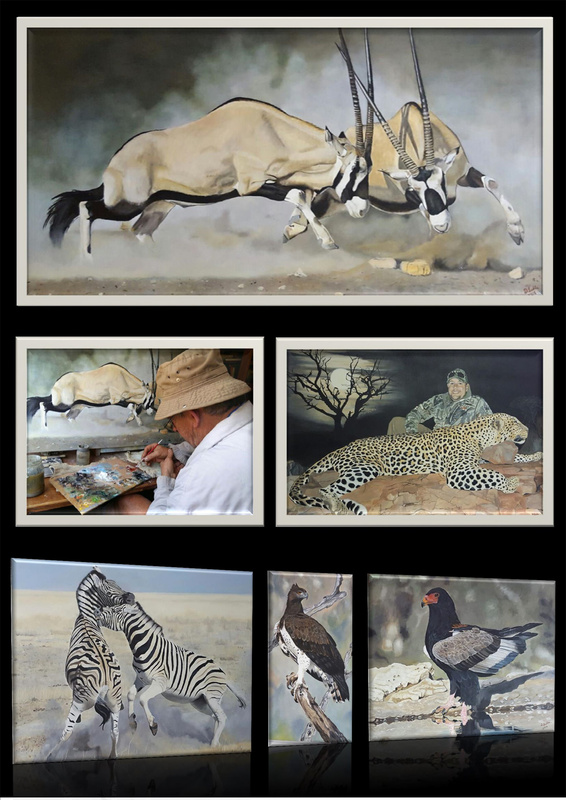 These paintings will be a great investment and memorabilia from your safari with us. Pricing is very affordable from just a couple $100’s. A fraction to what some artists charge. Each painting comes with an authentication and personalised certificate signed by Deon himself. Please support Deon if you love art and want to make a great investment. All artwork can be purchased during your safari or ordered online via our office. Note that all artwork is unique and one of a kind. Every piece comes with a personalised autentication certificate. Trophy Game Safaris brings you to Africa .... Based in the Limpopo Province of South Africa, we offer safaris all over Southern Africa with integral base support.